I was so excited when I found this sweater on Poshmark last month. It was brand new and for a fraction of the retail cost was! 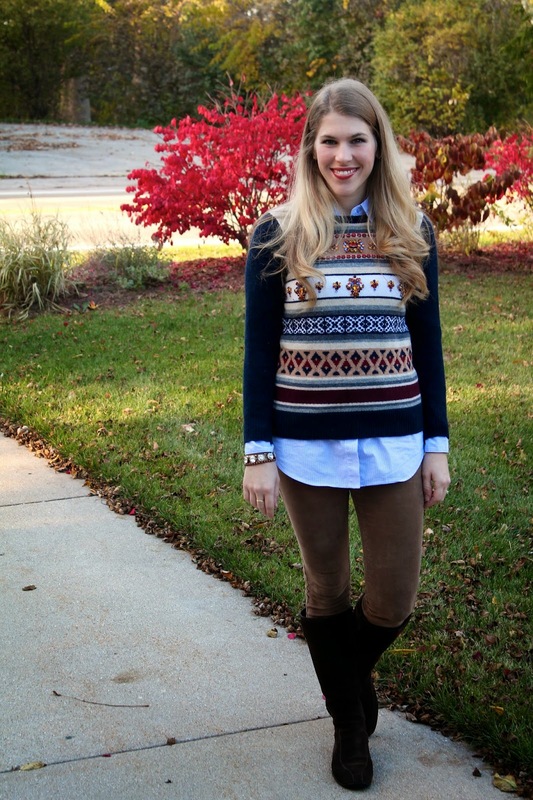 I had originally purchased this fair isle sweater from J.Crew Factory, but jeweled and navy blue are definitely more up my alley even if I did pay $15 more. Have you ever purchased something only to 'upgrade' a few days later? Just another reason to leave the tags on for a couple days if you aren't completely sure about a purchase. And another reason never to settle! I have definitely bought something to just find something else days later. Whoops! I am loving both your sweater and your pants! Very cute look girl! I am the queen of returns! It always helps to have time to think and look for other, less expensive options. So glad it worked out for you! I love how you paired it. That will be a classic sweater you can keep through the seasons. Queen of returns over here! You know I keep the tags on everything until I am certain I want to wear it! That sweater looks amazing and I love the way you styled it! Great buy! This might be my favorite outfit of yours EVER! I love that sweater and I love the color combo! This look is absolutely perfect! Love all of the colors! I did that once with a polka dot top that I bought at Old Navy. The Limited had one that fit me much better and was only $7 more. (But I actually ended up selling that top last year.) I've definitely done the same thing with jeans in the past. I never take off my tags until I know that I'm ready to head out the door. I really like this sweater. You're so crafty with your ways! Oooh yay for such a great find! I am weird about taking the tags off of things (I leave them on for a really long time) and it usually works out to my advantage. I'm finally at a point in life where I am willing to spend a little more on things that I love that I think I will have a long time! That's such a good find! I wore something similar yesterday. I love cords and boots. 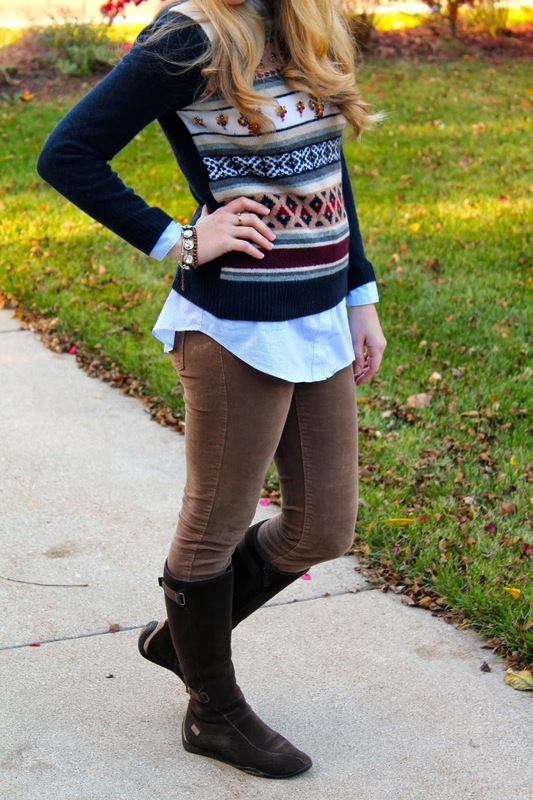 Cute sweater and love this preppy look on you! Love this kind of look! It lasts from Junior high, high school, college till now...., The contrast of your shirt and sweater is a big plus too. That sweater is gorgeous. Better than the first one you got and those pants go so well with it. I also love the one from The Limited. You look nice. I like the pattern on your sweater. Your sweater is striking! I love how you've layered it with a shirt underneath. Your trousers hug your legs beautifully and I love your boots too. Such a great look! fantastic sweater! I love the print! 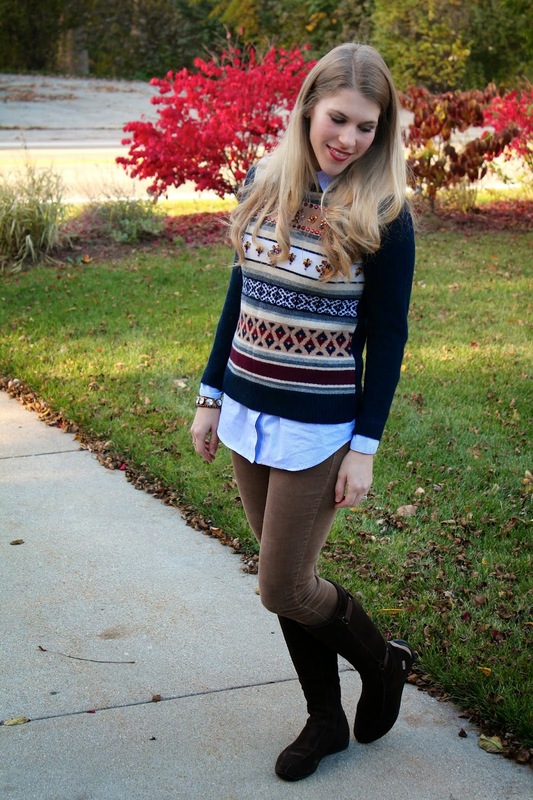 super cute fall outfit! 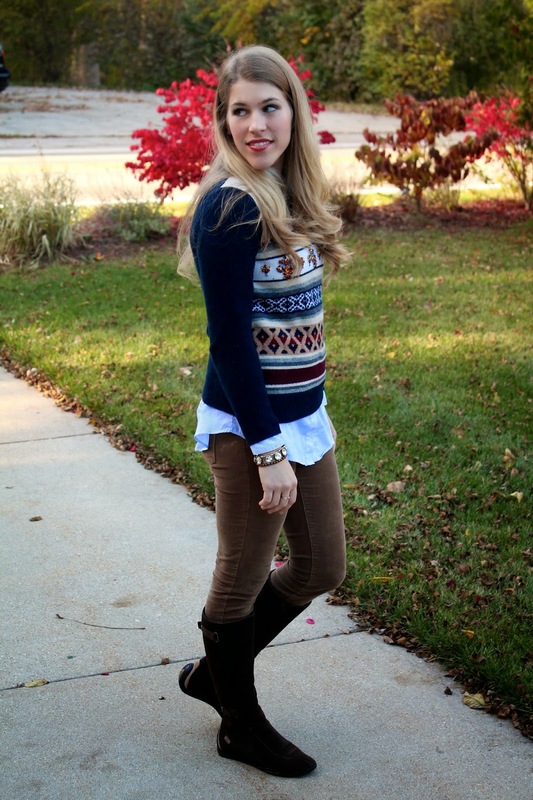 This sweater is so pretty on you, and I love it with the blue oxford underneath! That's definitely a valuable lesson I've learned over the past few years: saving a few bucks on something that's almost right is not worth it if you don't wear it! I'd say spending the extra $15 on what you really wanted was a wise decision! Oh I am quite familiar with this - and I'm so happy it worked out perfectly! The sweater is quite lovely. I love this sweater on you. I wasn't too drawn to this print but with how you styled it - I want it now! I always keep tags on my clothes in case I have buyers remorse which happens way too often. Gosh, you are just so cute, Laura! 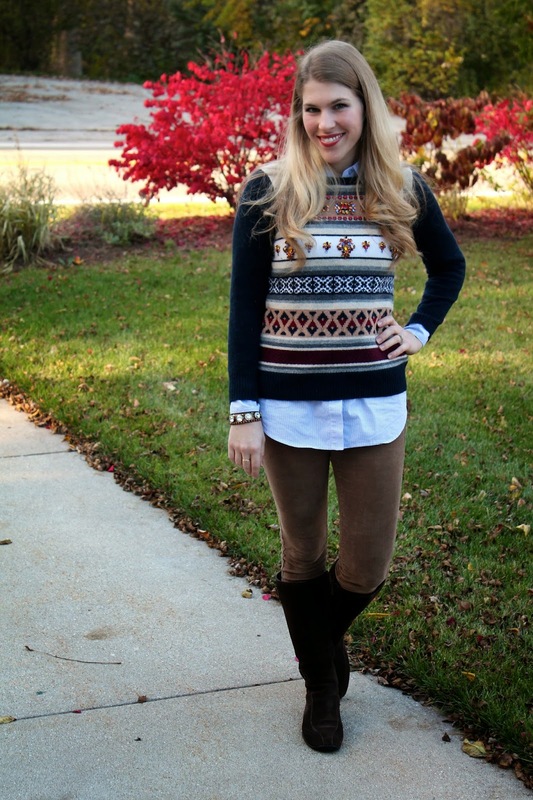 I had a huge love affair with fair isle (and argyle) when I was in high school, so I'm not ready to wear it again, but I like how it looks on you! !